Discussion in 'Freshwater Fishing Forum' started by FishDoc, Nov 20, 2017. Catching Chum and Coho Salmon on the Vedder River in British Columbia with the Piscifun Torrent Baitcasting Reel. This is my first year really starting to get into river fishing for salmon. The prior two years I had pretty dismal success. This year things are starting to make sense and I'm catching the odd Salmon. I've been using the Piscifun Reels including the Honor Spinning reel and the Torrent Baitcaster. The Torrent is mounted on a Angler SS float rod 10'6" that I have spooled with 20 pound Power Pro braided line. Today the guys fishing around me were catching salmon floating roe, but I didn't have any. So I tied on a pink Bent Rods Jig below the float and the action started quick with a nice male chum and then soon after a great wild Coho salmon. Ok, thanks that's very helpful. I can assume what you mean, but I'm sure it would sound much better coming from you. I don't know what New Pollution means either so you are not alone, I assume its not nice though. That is a pretty booty chum in the video, it sounds like you were still going to bonk it? That's what I'm thinking too California. Yeah I bonked that chum. I had never kept a river chum before so it was my little experiment to keep him to see how he tasted since I've heard negative things but like forming my own opinion. The video makes it look much darker then it really was cause the lighting was so terrible that day. I smoked him up and actually tastes great to me. I bonked a pretty fresh female a few days later and smoked them both together. I really can't tell the difference. Picture of female chum I bonked. I smoked him up and actually tastes great to me. I bonked a pretty fresh female a few days later and smoked them both together. I really can't tell the difference. I'd tend to prefer to bonk a doe if I were to do it (bonus is the roe). Your doe did look cleaner, chum do colour up pretty fast once in fresh water. Too bad the coho you got was unclipped, it looked pretty nice. If both Chum smoked up OK and you utilized them that's the main thing. Thanks for posting the video! Oh yeah would never waste a fish I caught and kept. The meat looked perfect, no funny smells, no rot going on in the fish that I could tell. 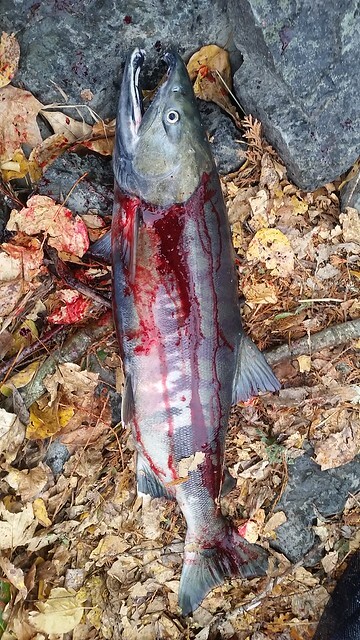 Caught in the lower portion of the vedder. Sure its colored up... but when you're smoking it I'm not sure if it matters that much. Sure he's a little on the ugly side. If I could chose the biters they would all be silver like this chum. Probably could have taken it out at this point but left it another hour and was a little shocked how fast it went. Final product, was actually surprised even though pretty dark its not fish jerky. Next time I will try not to smoke when its a wind storm and a few degrees above freezing. lazylump and bigdogeh like this. I'm guessing you didn't grow up eating northern pike and white fish. I think chum taste pretty good. Reminds me more of the fish I'm used to eating then a salmon. I think its all personal preference. Absolutely disgusting, your chum ain’t fresh and it shows it by the meat. Myself I'd like to see a few less chum and a lot more springs, coho, sockeye and steel-head... Seems the chum are a pretty hardy fish for some reason and it seems many rivers don't seem to have a shortage of them from what I've noticed. I wouldn't feed that fish to my dog... And that's what they're meant for lol. Aslong as you enjoy it tho you do you. Gave up fishing the vedder few years ago now. Still bar fish for coho on the Fraser here and there tho. I agree chums are not the best sports fish, but coastal rivers can never get enough of them. We all know how important their carcasses , eggs and fry are to the many animal, bird and fish species that depend on them for food and nutrients. Personally, and speaking as an ex angler, I think it was a mistake to allow anglers to retain chum and pink and salmon in freshwater. Not only are the fish best left in the river when in many cases they are within days of spawning, but imo, angler ethics seemed to change for the worse when we were allowed to kill them. bigdogeh and Whitebuck like this. I don't know if you can really tell what the fish looked like fresh after sitting in salt and brown sugar brine for 18 hours and then sitting out on the counter for 4 hours drying. 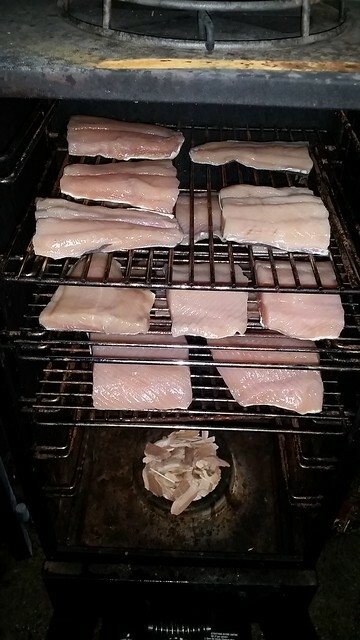 I'm not sure if you've ever seen fish after brining and drying, doesn't exactly look fresh. There's always some discoloration and opacity that occurs, which you're probably referring too. Even with the freshest sockeye it happens. The funny thing is to me the meat from the colored up buck looked nicer than the silverish doe when I filleted it. But at last I'm probably the only one who has eaten it, so I probably have the most experience eating them. As for you it seems to be all preconceived notions. Stereotyping. It's ok you don't have to feed it to your dog, I'm eating it. I think this follows the same line of thinking in Ben Harper's song, "Burn one Down". You guys should listen to it. As for the Vedder I've just started fishing rivers so it's my first river to learn. Many others to try in the area. I had fun on the Vedder this year and I get week days off so there usually aren't many people out there. To tell you the truth I'd heard all the stuff you guys are saying about chum before as well. I'm not one to believe what others say... I like to experience things first hand. So the chum had to die! Now I know. Actually I've had northern pike and loved it. Yeah see that's funny because you like pike and I think chum is like a mix of pike and whitefish taste wise. I know lots of people who think pike are disgusting and people who absolutely love them. I think pike is great, one of my favorite. Can be a little fishy sometimes in the summer. But Ice caught fish are prime. My favorite is perch though. I love ice fishing. Thanks for all your input guys. I don't mind. Everyone is entitled to an opinion. Lots of people eat out of dumpsters on this world. Maybe our time would be better off worrying about those people going hungry than me eating a colored up chum, eh? bigdogeh and Dave like this. Speaking of pike and ice fishing... can't wait! Fun times bigdogeh! Nothing wrong with pike what really makes or breaks it is where the fish came from and how large it was. I grew up spending summers at a fishing camp in northern Ontario ate my fair share of pike walleye lake trout brook trout perch bass. The pike that are larger then 30" often are old fish we would never keep them unless we killed them by accident (they Hook them selfs deep because there mouths at that size are huge). Water temperature and clarity/weedy lakes also will effect how they taste if they come from a clear water lake they have a very light taste to them. Same rules apply for walleye and lakers better to keep fish under 20" as they are much younger and taste better not to mention the larger fish are often the best breeders. 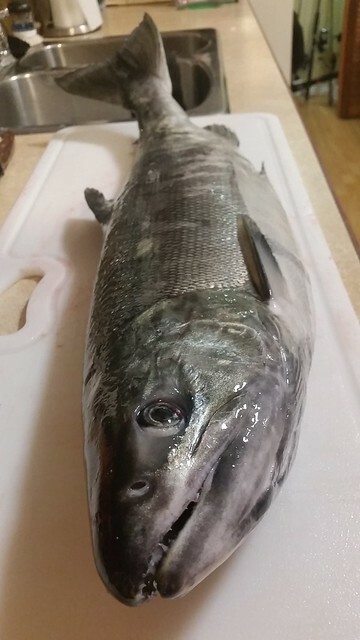 I have only kept one silver chum and I wasn't a big fan myself I also came to the realization once I filled my retention quota of coho and pink salmon I didn't need anymore for the season. To each there own of course! Great video keep them up! 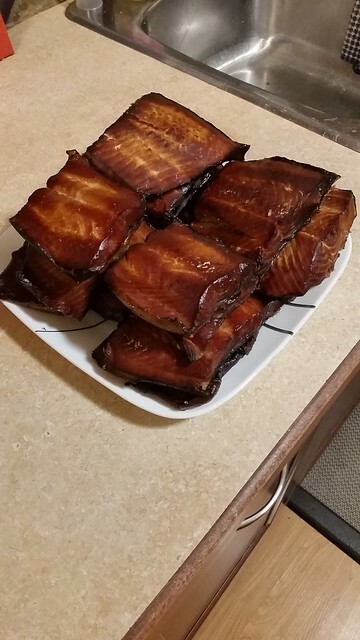 My neighbour, an old timer and lifelong fisherman was prejudiced against smoked chum too, until I gave him some of mine. 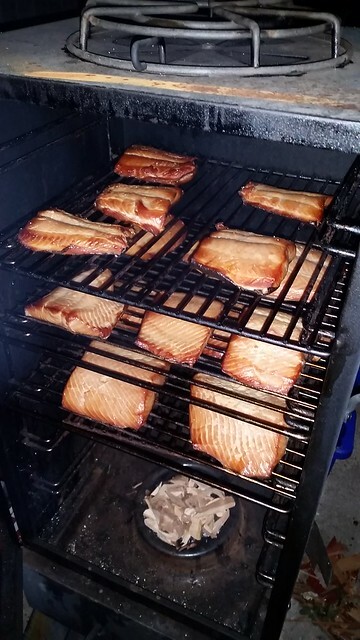 It was from a river estuary, so not technically river fish, but they smoke up great and I've yet to find someone that I've shared it with who doesn't find it delicious. I wouldn't say the pink fleshed ones are always better than the pale ones either. That said, the older ones tend to be mushy and are probably best let go. It seems to be key to bleed and ice them pronto and brine and smoke them fresh without freezing first. For sure, I actually stopped fishing right when I caught this one, blead him, gutted him right there and carried up to the car and through him in the cooler on ice. The flesh was not mushy at all.